​ My name is Jack Penrod, I came to Vernon Malone in 2014, when it first opened. I wanted to take advantage of this opportunity that was in front of me. Ever since I was little, I've wanted to do things that people said that I could never do, like riding a unicycle, walking on a tightrope in the air, Rebuilding and upgrading an engine. Having this motive helped me to learn that I need to try my best no matter what I'm doing, and that is why I tried my best on all of my art pieces that I have created in this class this semester. To start out the year, we began exploring different art mediums. 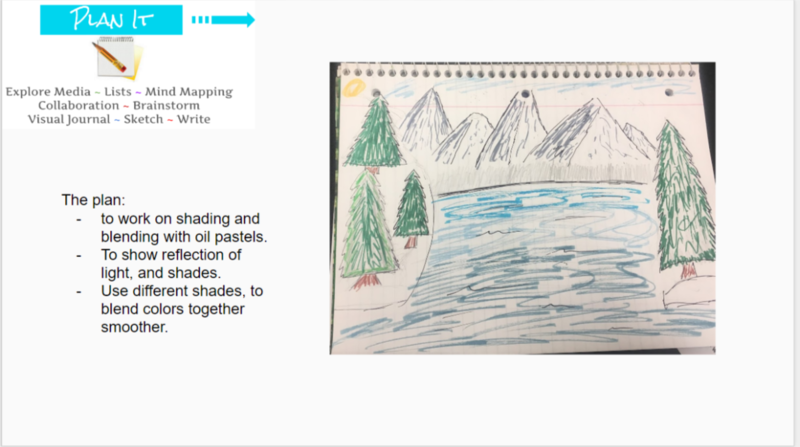 Doing this helped me to be able to find out how to create different types of art. I learned how to use oil pastels, Soft pastels, how to work better with Pen and Ink, Water colors and more. This practice strengthened my ability to create different art pieces with different mediums. I feel like my favorite medium that I worked with was Oil Pastels. I really enjoyed working with them in the beginning of the semester. 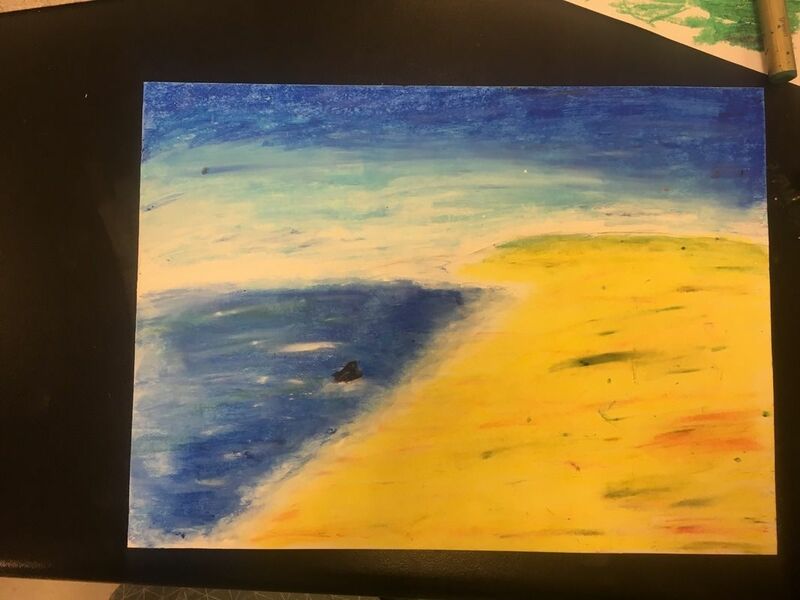 I know that I am not the best at drawing and painting, but working with Oil Pastels helped me to be able to work on blending different colors. Being able to explore this medium was fun to me, and I wish that I was able to create another project with Oil Pastels. In the beginning of the year, when I was exploring this medium, I created a piece that showed the sun setting on the water. Doing this I got to practice different colors and the reflection of the sun on the water. As I stated before about being able to mix and blend colors with oil pastels, this art piece helped me to be able to practice doing this. As I created each of all my art pieces, I tried to have an image in my head that I wanted it to look like. For example, with my photography piece, I knew what I wanted to capture in the photo, just not exactly how I would capture it. Trying time and time again not giving up, I finally got something that was worthy of keeping, Editing it and looking back, it is better than what I was hoping to capture. Something that really helped me when being in this class was not giving up. After doing an art piece, and it not working good, I would restart and try to fix, improve, and learn from what happened, and why it didn't work out the first time. I believe this was my best piece that I've created in this art class. This photograph with the quote has so much meaning to it, if you focus on different parts of it, with a true meaning to the photo. 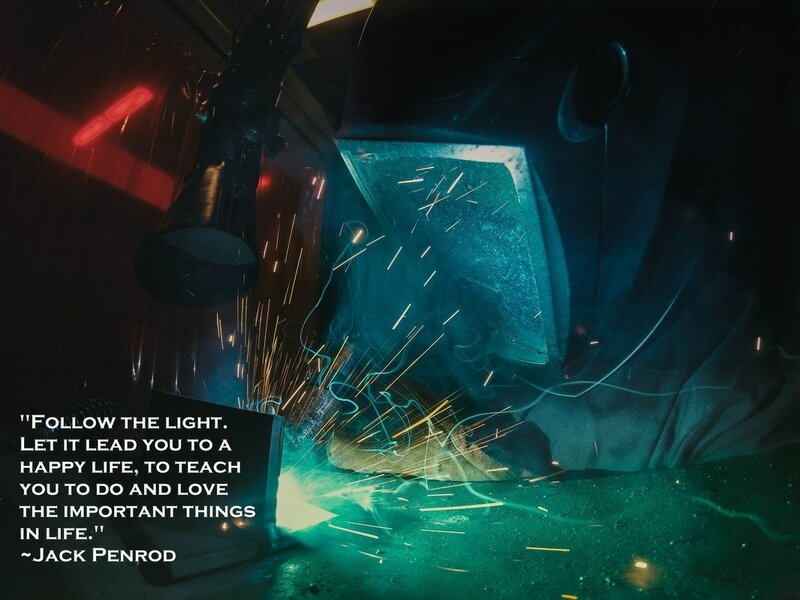 If people who see this photograph know me as the photographer, and person in the photo then they would know how Welding has inspired me to work harder in life, and how it's helped me to explore different things to do in life. This art piece has so much meaning, and that is why I believe it is my best art piece this semester. I feel as though art that was created somehow reflects what people feel, and who they are inside. 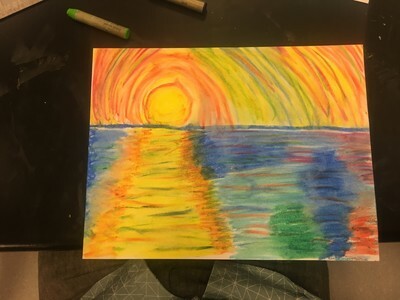 An art piece for example that is colorful, and bright might reflect that someone was feeling happy, whereas something that is dark and full of different emotions, may portray that they are going through many different emotions at the time of creating the piece. I believe some of my artwork portrayed who I am as well. My inspire piece was made to be able to inspire others to follow a happy path in life (or as stated in the art piece the "path of light"), instead of a path with many problems. This path is a figurative path, but is shown figuratively as well in the photo being the welding light. Not only did this show light, but the light is showing something that has inspired me in life. Welding has inspired me to build things, and also to create welding art, that I did not make for this art class. 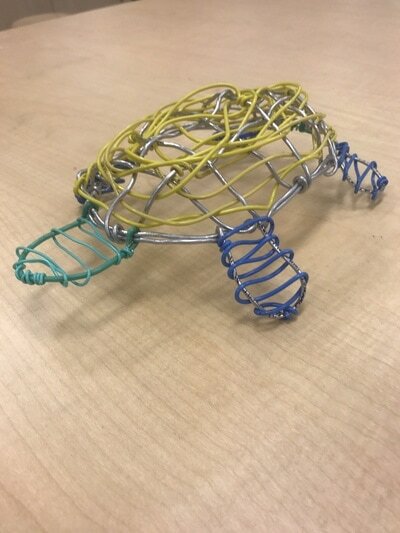 The project that I feel was the most challenging was the wire turtle. Starting out with just a long wire and some pliers was very intimidating, not knowing how in the world I was supposed to create an animal out of the wire. I created a strategy, creating the base of the turtle, and working myself around to the shell and the feet, which helped me to be able to make somewhere to be able to start my piece. Weaving back and forth, I eventually was able to create the turtle shell with a design and structure. I think I overcame the obstacles of not knowing how to start, to ending up with a final product. Planning what I was going to do helped me to create a way to overcome this obstacle as well. For this project, I wanted to try something with photography. I chose to do something that inspired me, and I want to use this to inspire others. Welding is something that I learned to enjoy at this school. Being able to use my brain and make things out of metal really interested me when I started coming to this school. I enjoy Listening to the sound that the machine makes while welding, and how welding looks under the hood. Looking at someone welding with your bare eyes can damage them, and that is why photographing welding would be a challenge for me, to get the right shot. When I wanted to start, I got my phone to take the picture for me on a time lapse as I was welding, so that I could take out the photo I liked, also be to be able to take the picture, and yet still be the person welding in the image. This worked out well, but the light from the welding overpowered the image, causing there to be a lot of white blurred out areas in the photo which made it harder to realize what the photo was actually of. To overcome this challenge I got my GoPro and tried doing the same time-lapse concept. This worked better because I could put the camera closer to the welding and not be too afraid that it would be damaged from all the sparks and globs of metal that come flying off. changing a few settings like on the camera I almost completely fixed the problems that I had with taking pictures on a cell phone. Another thing that I did to overcome the problem was trying different angles. Doing this, after a few more attempts created a Masterpiece. In the image that I chose for this final project, you can see the spirals of the gasses and smoke spiraling off of the metal where I was welding. This created an image that would not only interest other welders, but would be interesting for the common eye to see. After capturing the photo, I sat down on the computer and enchanted and edited it to emphasize the features I liked. This project was an inspirational project, welding is inspiring to me, but I wanted to be able to inspire others as well. After looking at many different quotes online, I decided it would be more challenging and best to create a quote that would inspire others and still have something to relate to the photo that I took so much effort to take. I came up with the quote "Follow the light. Let it lead you to a happy life, to teach you to do and love the important things in life." This talks about the figurative light that is seen in the photo, but it talks about an imaginary light, that lights up the path to a happy life style. I chose my favorite 2 pictures, to make into posters. 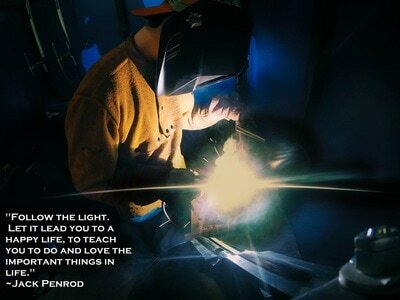 I personally like the second picture better,but feel like people that don't understand welding wouldn't appreciate the photograph as much as another welder, because of the colorful sparks and swirls. This is why I also chose to do the first picture, because you can see more, and anyone would more likely be able to understand what was going on in the photo. Working on this final project, I had many challenges. More challenges than I would ever think I would have with taking a simple picture and coming up with a quote to incorporate in the photo. I really challenge myself and enjoyed doing this last project. 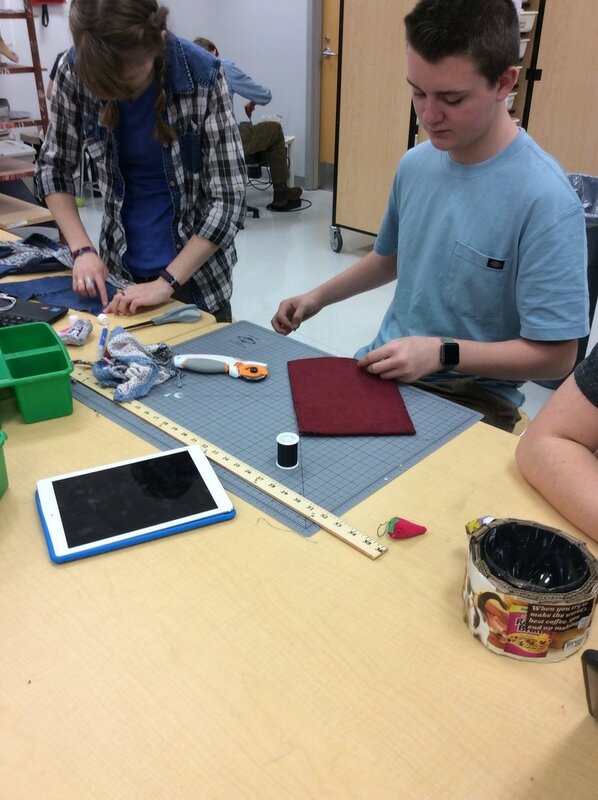 The art piece I created was a snug pouch with velcro on top with a flap, to hold onto the ipad. This is basically a protective sleeve for an ipad. My subject matter was textiles and fabrics, which I later decided to use felt to create this sleeve. To create this art piece, I got 4 sheets of felt, Layering them on top of eachother. 2 of the sheets are for the front, and two for the back. After cutting out the sizes that I needed based on the ipad, I started to hand stitch the sheets together. In my first attempt to make this my stitching was messy, not consistent, ​unorganized. After making the ipad sleeve one time, I decided to make a wow piece, redoing my attempt, and making it better. The second time around, the stitching is very organized, very consistent. I was very pleased with how the stitching turned out. My overall goal for this project was to create a sleeve, that could be used everyday for an ipad. I believe the goal that I had was successfully achieved. Overall, even though I had difficulty at first, and kept thinking I should just stop after the first one, I decided to Go the extra mile and make it into a wow piece. My Recycled art piece is a bookmark with spatter paint on top to give it a creative design to it. To create this set of bookmarks, I got a cereal box, and started to cut strips of the cardboard that I would then use to make the bookmarks. when I first started, I automatically started painting them with acrylic paint. Little did I know that I had to mod podge paper onto the cardboard first so that it would have a sturdier feeling to it. Doing this, it felt like the bookmark could take on more and more beats, making it last longer and stop from bending easily. After the mod podge was allied with the recycled paper I was very happy with the sturdiness of the bookmarks. Then, I moved onto the step of painting the bookmarks with acrylic paint. After painting each one different colors, I thought I had finished, but then I later decided I should spatter paint white paint on top of the bookmarks to make them more creative. I got this idea to spatter paint based on the paintings of Jackson Pollock. After doing this, I put a final layer of mod podge, to create a protective layer, so it can get wet, and scratched without getting messed up. I achieved my goal of making a creative bookmark that is different than other bookmarks that i have seen before. Overall, I am very happy about how my bookmarks. came out. ​When starting the project of making a turtle out of wire, I struggled with deciding where to begin. 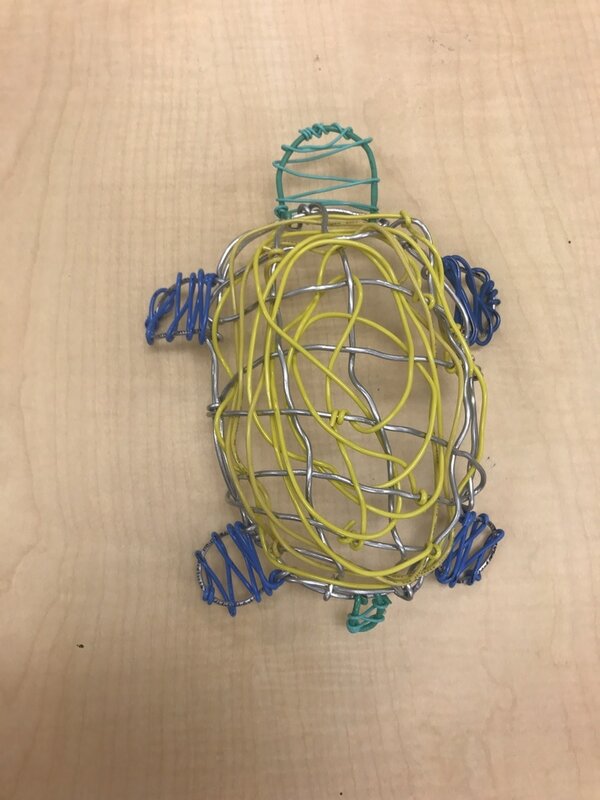 I chose the turtle because they have a simple shape, but yet could be still challenging to create with wire, to make this wire art. I decided that the best way to start would be to start at the base (oval shape) and create the feet. this way the structure of the turtle could build off of the feet, later adding the shell, head, and tail. I didn't choose the normal turtle colors, because I mixed it up with adding blue feet, and a yellow shell, This was it adds more to make an abstract turtle. With the help of watching tutorials, and watching other artists create similar art, creating other animals, I felt more comfortable creating the wire structure and the wire art.I feel like I accomplished my goal of making a turtle sculpture out of recycled wire. To create the shell, I weaved the aluminum wire back and forth from both ends of the shell, to create a base to wrap the yellow wire. To wrap the yellow wire I tried to weave it around the turtle shell in a circular motion. It was a struggle to know where to start out the project, and where to wrap, bend, and shape the wire to create the turtle shape. Overall I really enjoyed creating this sculpture. I have never used Acrylic paint before, but this learning experience was very fun and I learned a lot. When I first started planning my picture, I drew it out on the canvas with a pencil to sketch out where I would paint which colors. The painting process started, and the paint began to be very light colors but as I continued, I learned that the more layers of paint you added, the darker and closer your paint looks to the actual paint color. The experience working with this paint was complicated at first, but later became easier to manage and work with. The main problem that I had was the paint would smear on top of the other color paints, where I didn't want it to go. Then later I figured out that if I used smaller brushes, I could have finer detail than with a bigger brush. I really enjoyed working and remixing "The Scream" art piece that was originally created in 1893 by Edvard Munch. 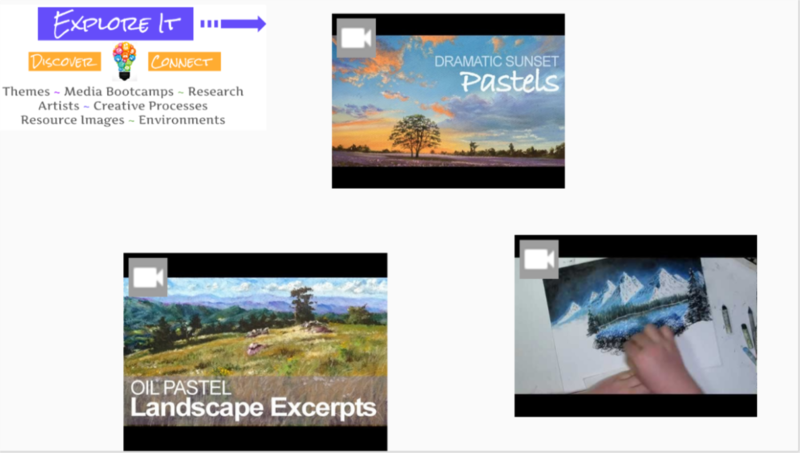 He created different versions of this painting which included being made with Tempera, Oil Paint, and Pastels. Edvard created many other fine art pieces, that can be inspiration to many other artists. My overall thoughts on how I did is that i think For the first time working with Acrylic paint I think I did a pretty good job. The first two days I practiced exploring the basics of oil pastels. Learning how to blend, and show lighting and how it affects the artwork. I was struggling with being able to turn a normal picture into something that could be done with oil pastels. 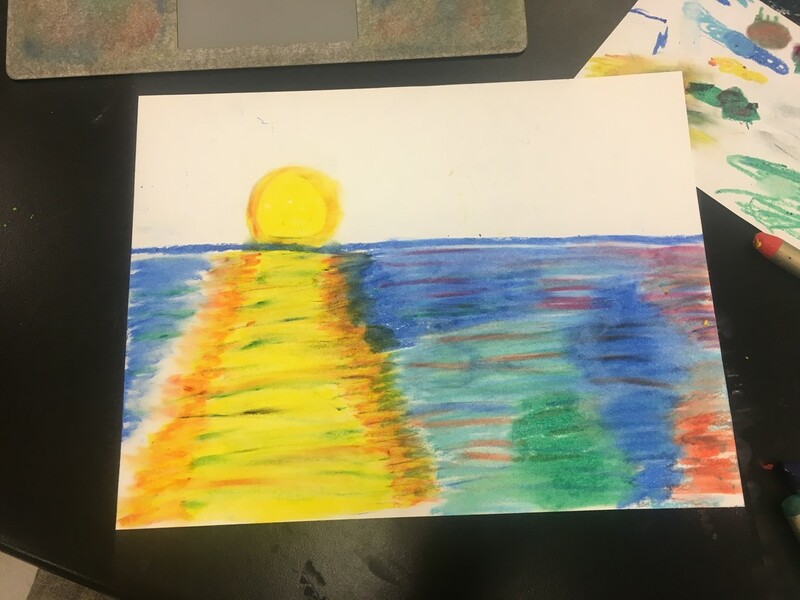 While working, Mrs. Shumann came and helped me learn how to use the oil pastels and how to blend them to make light reflections, and water. This help gave me what i needed to complete the practice. As I continued to practice using oil pastels, wanted to work on my ability to show reflections. I found a sunset reflecting off the water picture online, and wanted to imitate it with oil pastels. I have pictures of these steps that i took to document, but they will not load onto the weebly because it wont let me add blogs and pictures. Let's get something straight, I am no professional artist but here I am, trying my best at making art. Ever since I was little I liked to work with my hands and making things. Even though I am not an artist, doesn't mean I am not trying my best at everything that I'm making in this Art Design Studio Class.